Monte da Ravasqueira has been linked to the family for several generations. 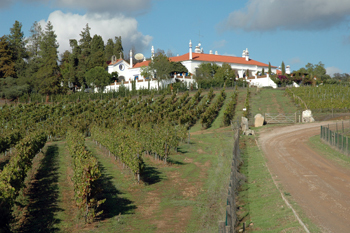 Located in the municipality of Arraiolos, about an hour’s drive from Lisbon, the estate occupies a vast area of typical Alentejan landscape. It is managed and run by Sociedade Agrícola D. Diniz, SA. Investment at Monte da Ravasqueira has also been directed at the infrastructures of an ambitious oenotourism project. Monte da Ravasqueira is committed to the production of distinctive quality wines, while it is also engaged in a number or other activities involving the production of cork, olive oil and honey, as well as rearing fine cattle and breeding the Lusitanian horse. During our visit to Lisbon, we met with many wineries and their representatives, but this was one winery that we were unable to accommodate. Monte da Ravasqueira did, however, leave four red wine samples for us to try at our leisure. And after shipping them ourselves back to Terrassa, Saturday evening provided us the perfect opportunity to taste 3 of their reds and 1 rose. Overall, we agree that they were technically well made and interesting to taste. Our notes follow at the bottom. The Alentejo region is like the “California” of Portugal, where one can grow just about anything with still plenty of room to experiment. It seems that every time I visit, or taste the wines from this region, I find something new and interesting. The Alentejo is filled with almost every type of grape being experimented with and every style of wine being explored. And with the intense summer heat, these wines tend to be pushed to alcohol levels that many find a bit excessive. In recent years, vine growers have had their work cut out for them as they try to balance sugar levels with phenolic ripeness. One thing is for sure though, the wines made here can be very intense in flavor and concentration and it is rare to see green flavors or under ripe tannins. As far as the Ravasqueria wines, they showed much better with food and with some time being opened than when we first tasted them in our living room. Big wines with strong structure, we popped the corks and had a quick taste before moving to the roof to grill some steaks. At first, we were less than impressed, and while the rose never really did catch our eye, it was nonetheless technically correct. On the other hand, along with our guests, we found that their red wines really came around after about 2 hours of being opened, but not decanted. I would most definitely seek out the Vinhas das Romas and enjoy this robust red with a variety of meats. While the simple Monte da Ravasqueira red and Fonte de Serrana both are perfect with pork and chicken, I would probably give them some air before consuming despite their lower price point. Unfortunately, we didn’t get to try any of the whites. Seeing that they grow a fair amount of Viogner, and being a big fan of this grape, I would have loved to taste it when grown in the Alentejo. One last thing. I want/need to complement the winery with building a website that should be a model to others. Easy to navigate with better than average translation and a clean layout, this website is a joy to use. Please take the time to visit the Ravasquiera website and learn more about the history of this winery and its wines. If all wineries here in Spain and Portugal had sites like this, you the consumer would be much better informed! Gorgeous light red color, brilliant and wild strawberry like. Geranium nose with light cherry and fresh rain soaked air. Slight wood note, with cheryy candy and some medium weight acidity. Blah!Kind of stops short of the finish. Muted flavors that really don’t develop. Dark in color dense and think to look at with big legs. Woody nose with strong smoke notes cassias, and some current, but dense, and needing time to fully open. Nice acidity nice tannins, soft wood, and overall a good mouthfeel. Vanilla, black cherry with some nice floral notes. Needs to open up. The alcohol again is a bit too much on this one at first but really starts to give way to a rich mouthfeel. 2 hours later this wine was juicy and softer in structure. Interesting to see what a couple more years of bottle age will bring. Blood red in color, deep yet not very concentrated. Smokey anise, with earth, charcoal and minerals. Only after some time does a rich cherry component seem to come out. Vanilla, cherry with a stone quality. High acidity, and med tannins that don’t seem in balance. A bit raw in the mouth with a simplicity that might benefit from some air. Much better wine after an hour or so, showing some earthy complexity. Deep purple blackish red in color, dense! This wine brings the oak with a smokey nose that shows some bacon fat, light violet, and black currents. Big oak, big acid med tannins…a bit dried out as far as fruit goes. Seems the oak is the star here. With some air you see a few berries sneak in and some meat notes.The alcohol becomes an issue for me too on this one. Just a bit too rich with not enough fruit. With about an hour of air this wine really became nice with much more fruit showing up.